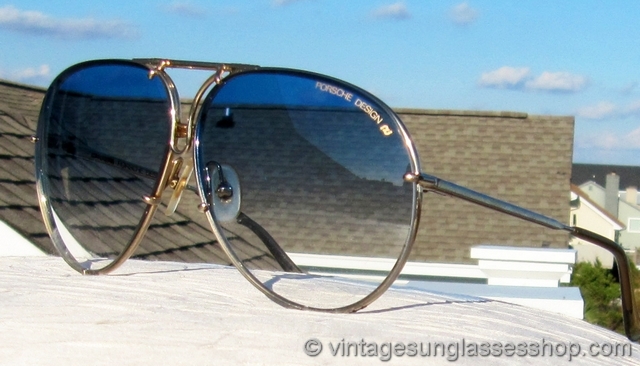 1 Vintage Carrera Porsche Design 5621 40 sunglasses feature the all gold plated Carrera Austrian frame and interchangeable brown gradient and gray Carrera Porsche Design lenses in the original black hard sided Carrera case with felt pouch to store the 2nd set of lenses. The center hinge on these Carrera 5621 sunglasses raises to allow the current set of lenses to be removed and the other set of lenses inserted into small prongs on the frame and clamped down with the center hinge. 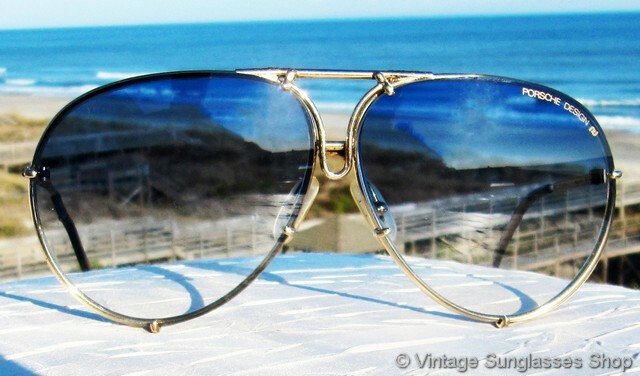 Vintage Carrera Porsche Design 5621 sunglasses are probably more popular today than they were when first introduced in the 1980s, and none are more popular than the 5621 40 variation with all gold frame. Carrera 5621 sunglasses are popular both with me and with women who appreciate its moderately oversized sunglasses style and look. Carrera revolutionized sunglass design with the Porsche Carrera line in the 1980s, introducing optyl as a lens material which was much lighter than glass and thus allowed for larger frame sizes. Both sets of interchangeable lenses look great with the gold frame which measures approximately 5.5" temple to temple with PD lenses which measure approximately 2.75" x 2.25" at the widest point. Both sets of interchangeable lenses are marked Porsche Design, and the inside of one ear stem is marked Carrera Porsche Design with the US patent number on the ear pad while the inside of the other stem is marked with the serial number plus Made in Austria 5621 40. 2 Step up another level beyond our already unequaled vintage condition standards with new old stock Carrera Porsche Design 5621 40 sunglasses in mint, unworn condition. 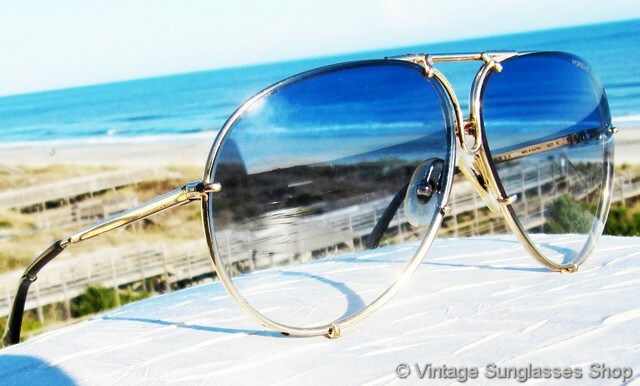 3 Substitute a set of rare Porsche Design blue gradient lenses to go with a second set of either gray or brown gradient lenses for the iconic 5621 40 gold plated frame. 4 Substitute a set of cool Porsche Design rose lenses to go with a second set of either gray or brown gradient lenses for the iconic 5621 40 gold plated frame.